The Printworks in Manchester is one of the most innovative entertainment centers in the North West. It is a leisure complex in the center of Manchester city that originally housed the printing works. The outer fa?ade of this building is more than a century old and was home to the Withy Grove Press, which was the largest press works in Europe. The Press ceased to function after 1987. The devastating bombing in central Manchester in 1996 wrecked the Withy Grove premises. The first urban entertainment center of Europe was then planned in its place. Thus was born the Printworks as it appears today. The complex has something for everyone. With caf?s and bars and a health complex, the Printworks in Manchester is reflective of the rebuilding of Manchester. It spans 350,000 square feet and cost nearly ?150million. 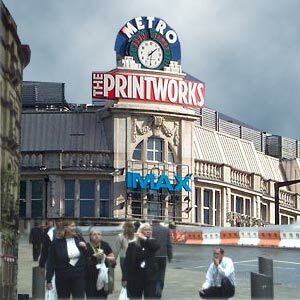 The Printworks has a huge IMAX screen and multiplex with 20 screens. You can sample cuisine ranging from freshly cooked noodles and rice to the all American burgers, ribs and steaks or even Cajun and Creole dishes. The Health Club offers excellent facilities such as spa pool, poolside sauna and various pieces of equipment. You can browse through a vast collection of books and even participate in store events.